Devoted to the cause of the Promotion of the Federation of Nations. 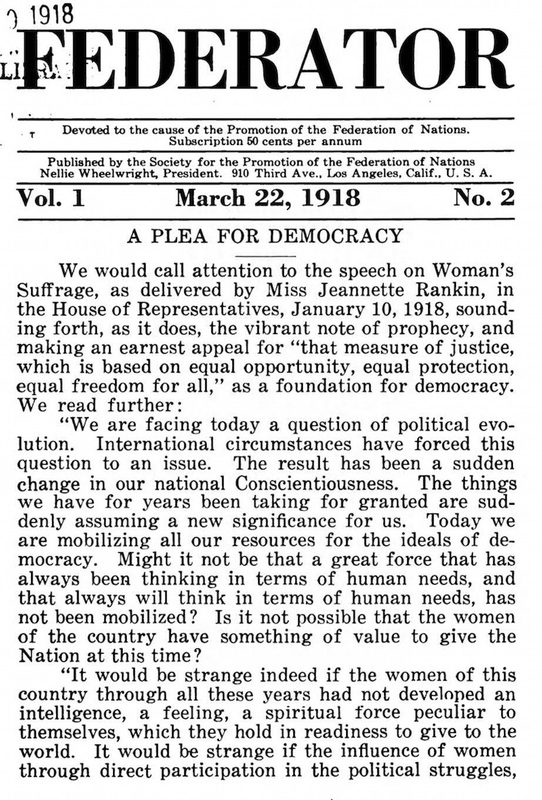 1/1, February 22, 1918. 50 cents a year, 16 pp. (varies). Although the impetus of the journal was Mazdaznan, it was devoted specifically to the promotion of the Society for the Promotion of the Federation of Nations. This was "the only one of its kind expounding the science of geneological [sic] ties of the Twelve Tribes of the Aryan, or White Race, defining the gradations of Progress, leading to final emancipation." It studied the wonders of the White or Aryan Race, the sixth great race of mankind, and the dangers of miscegenation with other, lesser races. Its anthem, "Federation of Nations," with words and music by “O.Z.H.” -- Otoman Zar-Adusht Ha'nish, Otto Hanisch -- was printed in the first issue. At the beginning of 1919 the journal was merged into Mazdaznan, the principal organ of the movement in the United States.